To listen to this week’s Epsom and Ewell talking news, click the Play button. The weekly news is just one of three sections of the Epsom and Ewell as described on the About Us page. Many of these news articles can be read in the local Epsom Comet. The Annual General Meeting of the Talking Newspaper was held at Swail House on 14th March 2019 and Judy Sarssam gave her Chairman’s report. You can listen to the report by clicking the following Play button. Documents for the AGM can be accessed by volunteers or members by clicking on the links in the sidebar. If you require a transcript please contact us. 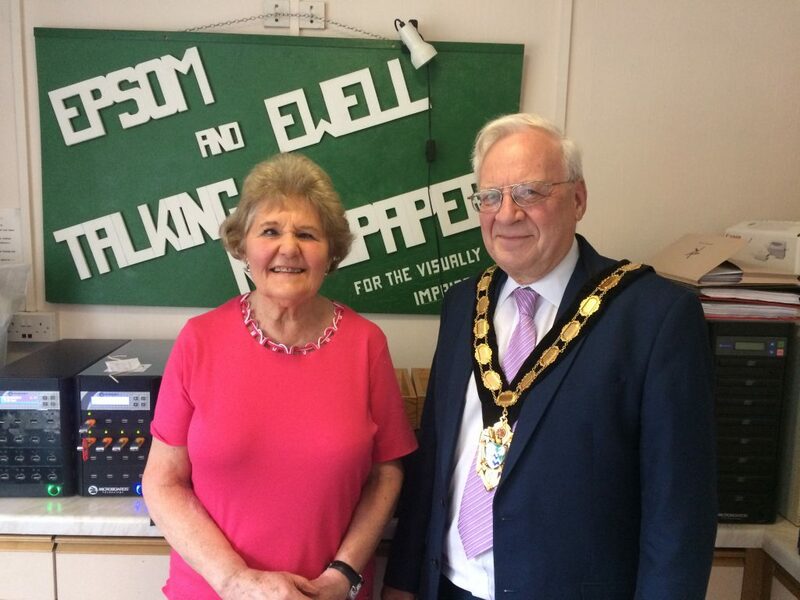 On Thursday 28th February, the Mayor of Epsom and Ewell, Counciller Neil Dallen, visited the Talking Newspaper studio. The Mayor met volunteers and was interviewed by our Chairman, Judy Sarssam. You can hear the Mayor answer questions from EETN members ranging from what will happen after Brexit. Will we still be twinned with Chantilly? To ideas on how to ensure the borough is meeting its housing needs and finding out the residents future vision of Epsom and Ewell. The Mayor also tells us about his remaining charity events but hurry as, although extra tickets are now available, tickets to the Mayor’s ball are selling out! Feedback Our Chair Judy Sarssam, who is visually impaired, used her computer’s speech to text application to read out EETN listeners’ questions to the Mayor. We would be grateful if you could provide us with your feedback on how you found this interviewing technique, for example did you find it distracting, inspiring or somewhere in-between. Please click on the speech bubble or go to comments section to give feedback. Thank you. 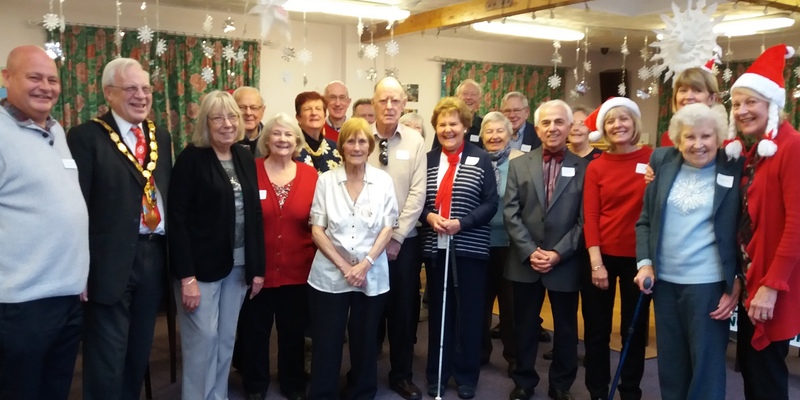 Our Chairman Judy Sarssam and volunteers from Epsom and Ewell Talking Newspaper, welcomed Cllr Neil Dallen, Mayor of Epsom and Ewell and his wife, Ann, to a special double celebration in December. 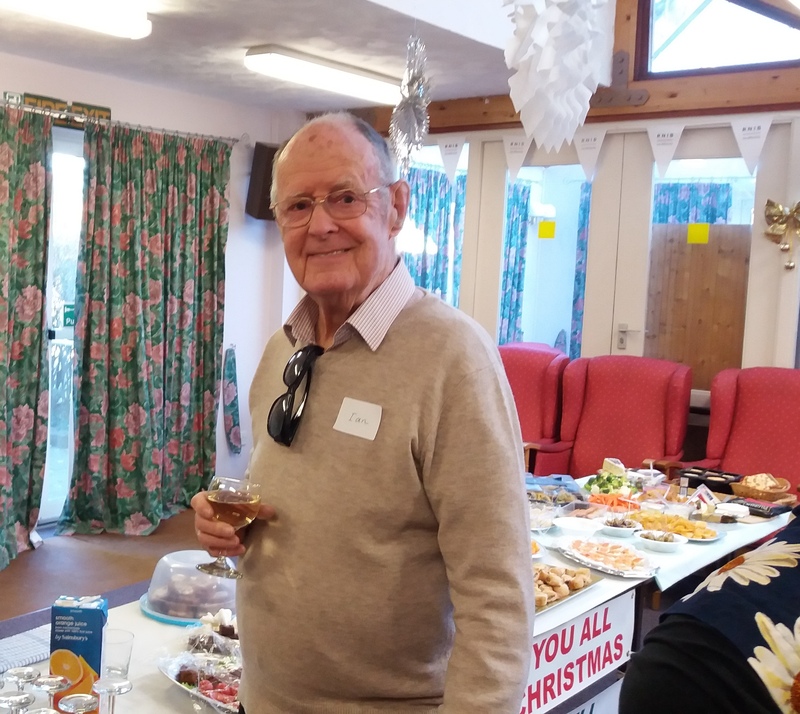 Christmas hats and jumpers set the festive mood, but before everyone enjoyed the tasty buffet, all supplied by the volunteers, Judy had a surprise in store for one special colleague. 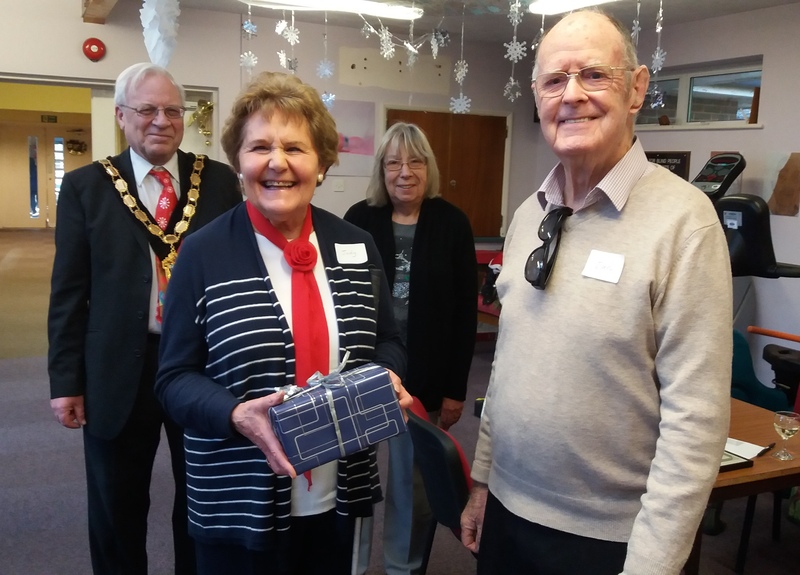 After thanking the Mayor for his time and dedication to raising funds for his chosen charities, of which EETN is one, Judy then revealed that this was not just a Christmas celebration, but also an occasion to recognise the work and dedication of a very much admired colleague. Ian Tennent, who has been with EETN for more than twenty three years, had decided that at 87 years old it was time to step down from his role as Magazine Editor. Arriving at the Xmas celebration with his wife Dorothy and daughter Becky, he was surprised to find that he was about to make the ‘News’ himself. Eamon McNamee from Central Surrey Voluntary Action told the volunteers that Ian’s dedication to EETN had earned him the respect of both the listeners and volunteers, many of whom had been helped by Ian when they joined the team. He added that Ian’s role had required an enormous amount of home preparation prior to the recordings. 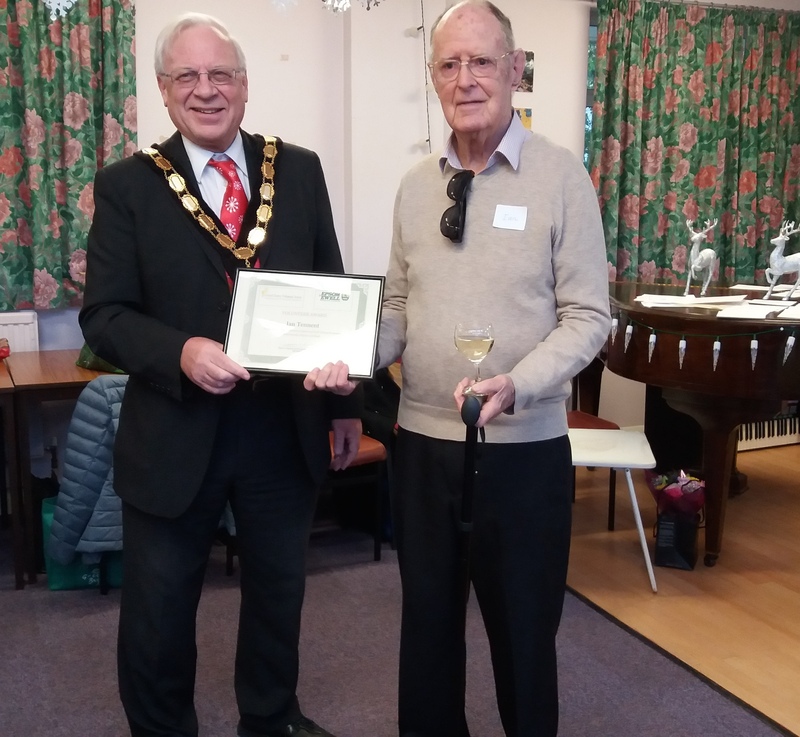 The Mayor, Cllr Neil Dallen, also praised Ian for his long service and ‘Outstanding Contribution to Epsom and Ewell Talking Newspaper’ and then presented him with a signed and framed Award. We hope you enjoy our new regular audio broadcast detailing the events and information about what's is happening in Epsom and Ewell. We are currently advertising for a volunteer News Editor. No experience necessary. All ages welcome. including Champaign and wine reception. An Auction will also take place at the Mayor’s Ball. where you can private message your maximum bid.